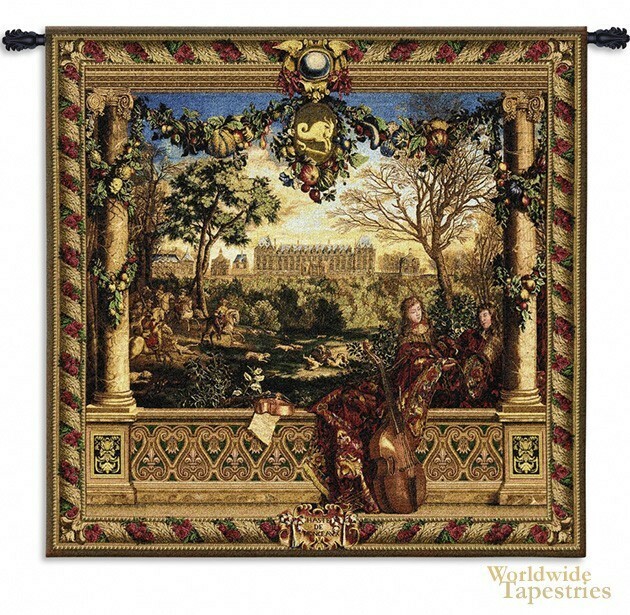 Le Chateau De Monceau tapestry shows a gorgeous scene of the gardens of a French castle. In this work, we see ladies enjoying the gardens of the chateau, with musical instruments such as the cello and violin. A balcony is seen with ivy decorating the scene arranged in a garland formation. Members of royalty are seen in the gardens beyond, as is the palace. The work is decorated with a gold and crimson border. This piece celebrates the beauty of royal gardens and the countryside. Le Chateau De Monceau tapestry is backed with lining and tunnel for easy hanging. Note: tapestry rod, where pictured, are not included in the price.